Fabiano de Oliveira, a Brazilian man detained by immigration officials, was allowed to come home. Karah de Oliveira, his wife, found out around 2:30 p.m. Friday that he was being released, when her husband called from the Plymouth County Correctional Facility, the maximum security prison where he’s been for the past month. The family, who lives in Beverly, MA, were reunited at the U.S. Immigration and Customs Enforcement (ICE) office in Burlington, Massachusetts on Friday night. It was the first time Fabiano was able to hold his wife and their five-year old son. The family is reunited as Fabiano goes through a legal process, hopefully resulting in permanent residency. The de Oliveira family live in the city I call home. Fabiano’s story is that of countless others. He left poverty in Brazil in 2005 and came with the dream of making a better life. He worked hard to send money back to his family. He and Karah (a life long resident of Beverly) met in 2010 and married in 2016. They have a child. Fabiano has worked hard, paid taxes, kept out of trouble. By all accounts he is a loving family man, a good employee. The kind of guy you’d be happy to have as a neighbor. The only problem is he lacks the proper documents. This makes him illegal in the eyes of the Trump administration and resulted in his arrest and detention for the last month. Arrested ironically when he went to an ICE office to fill out paper work for legal status. That he was released is great news. But the reality is that tens of thousands of others with similar stories remain incarcerated. Most like Fabiano are loving parents, hard workers, good neighbors. The truth is that the rate of criminal activity is far lower for undocumented immigrants, than those of us who are citizens. 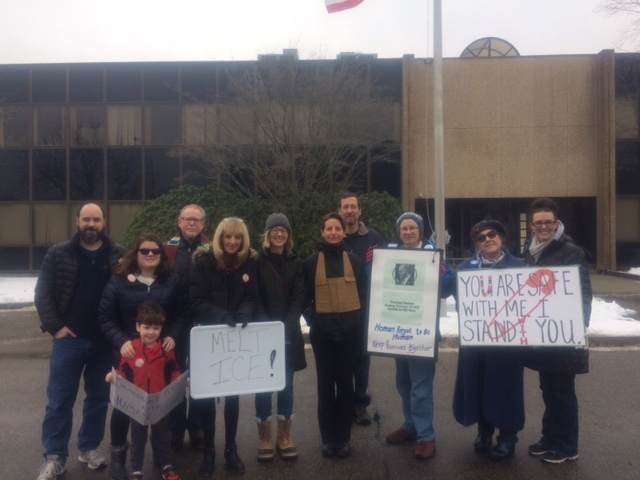 On Saturday a dozen of us gathered at the ICE office in Burlington for a prayer vigil. We had heard that morning that Fabiano had been released. Our vigil continued for those who remained incarcerated. Imagine our surprise when Fabiano and Karah showed up to say ‘thank you’ for supporting them and ‘thank you’ for continuing to stand with and for other families being torn apart by the current immigration policy. It has been said that the nation we become is determined by regular citizens like you and me. We stand vigil for those who are most vulnerable. We refuse to be silent. We refuse to be complicit with an unjust immigration system. America has always been as much an idea as a place. A place where if people work hard and respect others, they find a welcome. Mr.Trump is putting in place an infrastructure of prisons and an increase of ICE officers, that will result in a more than doubling of those detained or deported by the end of 2018. The capacity for annual arrests and deportations will soon reach 540,000. Each of these numbers has a face. Each has a story. Each life detained and deported has a ripple effect that affects countless others. That tears at the fabric of a community. Here in the small city of Beverly, Massachusetts, we got a taste of what this ruthless policy looks like. It was visited upon one of our own families. That enough of us stood up and said ‘no’, ‘not in my name’ gives me hope. The nation we become requires constant vigilance and persistence. There are many more families who look for people of conscience to stand with them. To stand up for the American dream. Joe, love that Margaret Mead! Keep up the good work, Kent! Thanks Marge. Good to partner with you in sharing the Good News.